The Hamilton and Davis families have a history—a century of feuding that has dwindled to little more than dark tales of violent death, lingering ghosts, and ancient curses since the only survivors of the two families are a rootless stranger who has never set foot on Hamilton land and two sisters, struggling to get by, and to care for their Apache-Irish grandmother who keeps the stories of the feud alive. Blade Hamilton never knew his father, and he is shocked to learn that the man has left him Hamilton Acres, overgrown land that used to be the family ranch, and the ancestral house, which looks like a setting for a horror movie. Blade grew up with a wandering mother who reinvented herself with each successive husband and whose emotional ties to her son were almost nonexistent. All he knew about his father was his name. He has never called any place home, a habit reinforced by his military service and his current job as a special agent for the Bureau of Alcohol, Tobacco, Firearms, and Explosives. Other than a certain curiosity, he has no feelings about the land he has inherited. His plans are to sell the property, which he guesses is less worth than the vintage motorcycle on which he rode into Crossroads, Texas. Dakota Davis delayed her plan to become an architect five years ago when her mother was killed in an automobile accident that left Maria, Dakota’s older sister, blind. Dakota was only twenty, but she grew up in a hurry. With her mother dead, her grandmother inhabiting her own version of reality, and Maria recovering in the hospital, Dakota became head of the family. Now she supports her small family by working as Crossroads' only real estate agent. Her income is supplemented by the sale of Maria’s homemade jellies and jams. At night, she studies architecture and dreams of the houses she longs to build. Between her job, her studies, acting as errand girl for Maria’s growing business, and keeping an eye on her grandmother, Dakota has no time to regret her nonexistent social life. When she first sees Blade, she thinks he is a Hamilton ghost, but it takes only one meeting for him to become fully flesh and blood and a major irritant, albeit one who is too good-looking for his own good—or for hers. Blade expects to be in town for only two weeks. He is not interested in permanence, and Dakota is not his type anyway--or so he keeps telling himself. Dakota doesn’t have time for the complication that is Blade, and she is still half certain that the only safe Hamilton is a dead one. But she can’t stop thinking about Blade. Then, the push-pull of their relationship takes a turn when Blade is shot after he is deputized by Sheriff Dan Brigman who has a double murder and other suspicious activities to investigate. Can a wandering Hamilton with no home and a hot-tempered Davis solidly rooted in her home have a future together? Meanwhile, Lauren Brigman has returned to Crossroads still in search of herself and her purpose in life. She publishes an online community newspaper, considers other things she might write, and spends a lot of time thinking about her might-have-been-but-never-was love affair with Lucas Reyes. Lucas, now a successful lawyer, believes he is a danger to Lauren and tries to stay away from her, a task made easier when he insists that Lauren’s father lock him up in the local jail as suspect #1, even though no one really believes honorable Lucas is the murderer. The bad guys are caught, and lots of Crossroads characters prove themselves heroes. But after a dozen years of the on and off (mostly off) of Lauren and Lucas, can this pair finally find happiness together? 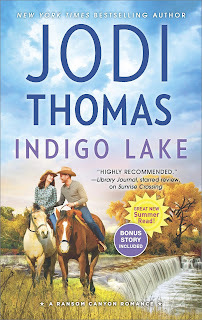 Jodi Thomas has long been one of the best storytellers writing romance, and she has the awards to prove it, including a spot in the Romance Writers of America Hall of Fame. Her Harmony series is one of my all-time favorites, and I have enjoyed the earlier Ransom Canyon novels. Indigo Lake is the sixth book in that series, and I’m of two minds about it. I loved Blade and Dakota. Thomas is unique among the authors whom I read regularly in her gift for creating off-beat characters who qualify as outsiders. The twists and quirks in these characters and their stories’ underlying affirmation that everyone deserves to love and be loved has kept me reading Thomas for many years. Blade and Dakota are part of this tradition. They are appealing as individuals, and as a couple, they offer satisfied sighs and smiles. Since I have followed the series, I also enjoyed seeing some favorite characters from earlier books play a role in book six. Charley Collins (Lone Heart Pass) is at the top of that list. If the novel consisted only of Blade and Dakota’s story, I’d rank it a solid four-star read. But there is also Lauren and Lucas’s story. It was a major disappointment. These are characters that readers met in Ransom Canyon, the first book in the series. Across the series, readers have seen them move from high school to college to post-college work. Many have viewed them as a couple meant to be together, but Lucas’s determination to achieve has delayed any significant connection again and again. I’m sure I am not the only reader who was invested in their story and rooting for their HEA. Theirs was the story I wanted to love. Instead I found the story’s development thin, and Lauren distressingly passive. By the end, I was largely indifferent to what happened to them. Overall, this is not the best book in the series, but Blade and Dakota make it worth reading nonetheless. If you have read the earlier books, the positive will outweigh the negatives. You should add the book to your list. If you are new to the series, start with Ransom Canyon. Maria Davis, an interesting, endearing character, will be the heroine of a novella, A Christmas Affair (October 1), and I’ll definitely be reading that one. Thomas begins a new series in the spring. I look forward to that as well. I was given the first book in the Ransom series and I have enjoyed reading the rest. 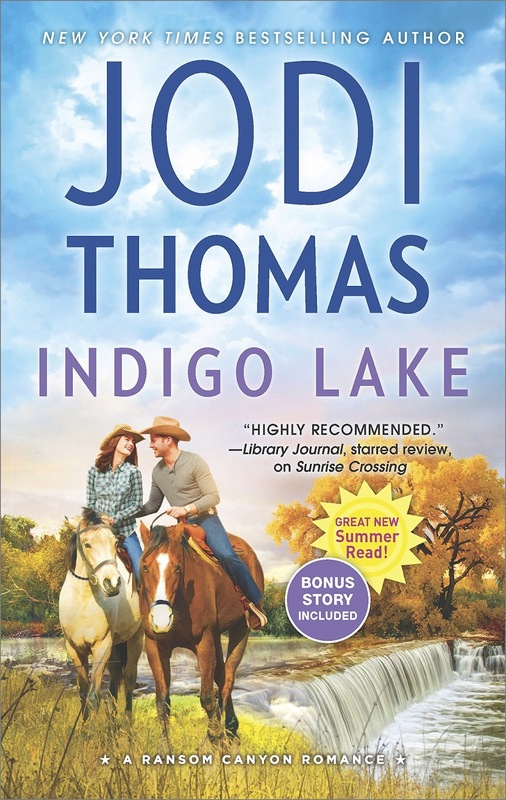 Jodi Thomas really is a superb storyteller, isn't she? Love these books! Just got it the other day I hope to get to read it soon. Enjoy! I'm not sure if the novella will end the series, but it looks that way with the spring book definitely not a Ransom Canyon book. Regardless, it is a strong series.